Laugh, cry, eat (but don't talk while eating) with the Vescovi family. 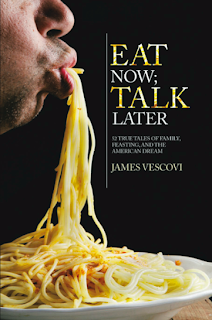 Synopsis of Eat Now; Talk Later by James Vescovi: Prepare yourself for a feast consumed in delicious bites. This collection of stories can be read before bed, on a lunch hour, or waiting in line. They can even be shared with friends who complain they have enough to read. Together they ask the question, "How do you make modern life run smoothly for parents or grandparents who grew up in an era when oxen were used for plowing, children left school after third grade to tend chickens, and meat was eaten only twice a year? When Tony and Desolina Vescovi arrived in America, they collided with the 20th century. Born around 1900, they were stumped by telephones, banks, fast food, TV wrestling, and supermarkets. It was up to their only child, a son, to serve as their shepherd, and it wasn't easy For example, how to explain that his job was taking him and his family 700 miles away when, in their day, sons stayed put to work the family farm? Or that it wasn't wise to hide $10,000 in the bedroom? Or that the ice cream they just tried and enjoyed is called 'Chubby Hubby'? This collection of 52 bite-size stories offers a twist on the American immigrant tale and is a testament to love, loyalty, and frequent half-truths. 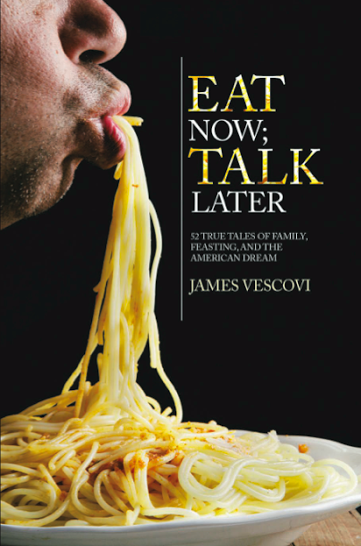 With heartwarming humour and an overwhelming love for his family members, James Vescovi tells his family history in 52 vignettes. Hailing from rural Italy, his grandparents immigrated to America and what an interesting clash values-wise, culturally, and technologically it is! Get to know three generations of the Vescovi family, Antonio (Tony) and Desolina, their only son Selvi and his family, and the family of grandson and author, James Vescovi. Vescovi's little tales brought a smile to my face, but then he has also broken my heart. This book's compilation brings into sharp focus the circle of life: from the young and hopeful Tony and Desolina immigrating to America in search of a better life, establishing and assimilating themselves in a foreign land, growing their family, and the inevitable aging and their passing away. But the journey is filled with the stuff that makes their lives unique: lots of humour, spunky remonstrances from Desolina, a get-it-done attitude from industrious Tony, mad money floating around the house, oh, and lots of good food and eating! This is an excellent memoir that many people will undoubtedly see themselves in, in some way, in the people or the circumstances described. Obviously, the immigrant experience is a highlight of this book. However, it also shows us the challenges of aging parents and how families cope to provide the care and support. But what struck me most were the values that the Vescovi family hold dear: hard work, honesty, familial love, and valuing their Italian roots. The stories are short and sometimes without resolution. But such is life - sometimes things just are. Vescovi has an engaging way of telling his stories. This book felt intimate, like sitting down with him for a visit -- all I needed was some limoncello (ok, maybe some coffee) with my book! The photos also lent an air of flipping through an old photo album -- everything felt real because I could imagine each of the Vescovis in my mind's eye. While Vescovi argues that his family lives "quiet, anonymous lives," this memoir has shown what special people they are. A special treat is how the Vescovis have compiled some of their family's recipes at the back of the book, a testament to how they value their food and the memories surrounding eating. After all, that's where the title came from! Verdict: I loved this memoir! This is special -- read it! It will make you realize just how precious our family members are, with all their quirks and their faults. It will make you realize how fleeting and forgetful we can be of our family histories if we fail to capture the stories told orally. I highly recommend this memoir to anyone who has an interest in family histories and of documenting them. With three generations documented here, this has a multi-generational appeal. James Vescovi's Guest Post: Don’t believe you’re a born storyteller? Read on. I received a manuscript from the author in exchange for an honest review. Love this!! Italians, Greeks and food... my kind of language! LadyD, you're going to love this one! This DOES sound like a special memoir. Also, I love any book with recipes at the end. I might have to pick this one up sooner rather than later. If you can get a copy, that'd be great! I read an unbound galley and of course the photos weren't great. I'm totally buying my own copy of the finished book. I have this on it's way to me for review. I'm really looking forward to it. And thanks for linking your post to Foodies Read 2014. This sounds so good! I recently read and enjoyed The Glass Kitchen (fictional) because of it's focus on the relationship between food and emotions. It seems like this book might work for me for the same reason. I just saw your review of Glass Kitchen! Food has always played a big part in my own life, so I love how Eat Now Talk Later is a subtle foodie memoir. I hope you get a chance to pick this one up!